On 19 February 2018, The Rice Department, Ministry of Agriculture and Cooperatives and GIZ formally wrapped up the successful Better Rice Initiative Asia (BRIA) project in Thailand, and proposed new directions and policies to expand their cooperation with other organisations with the aim of achieving sustainable rice production. The meeting took place at the Rama Gardens Hotel in Bangkok. The BRIA project is financed by the Federal Ministry for Economic Cooperation and Development (BMZ) and implemented through a collaborative arrangement between The Rice Department and GIZ, with participation from government organisations and private sector agencies, among them the Department of Agriculture Extension, Bayer Thai Co.,Ltd, BASF (Thai) Limited and Olam International Limited. BRIA operates in Thailand, Indonesia, the Philippines and Vietnam to develop rice production and consumption through a value chain system to increase the income of producers and promote good nutrition among the farmers. Rice Department director-general Anant Suwannarat said: “The Rice Department is responsible for the planning and implementation of the national rice policy and strategy through research and development of rice seed, farming practices, post-harvest and processing, and rice standards. We also cooperate with other countries on rice quality improvement and farmer’s capacity development. One such collaboration is the Better Rice Initiative Asia project, or BRIA, on which GIZ has worked with the Rice Department since 2014. “Over the past 4 years we have joined forces in developing the quality of rice for sustainability. We have achieved our objectives in Thailand, where knowledge of technology has been transfered to small-scale farmers at community rice centres. These centres were set up by the Rice Department to produce good quality rice and reduce the cost of production while increasing rice yield, which helps the farmers earn more income. 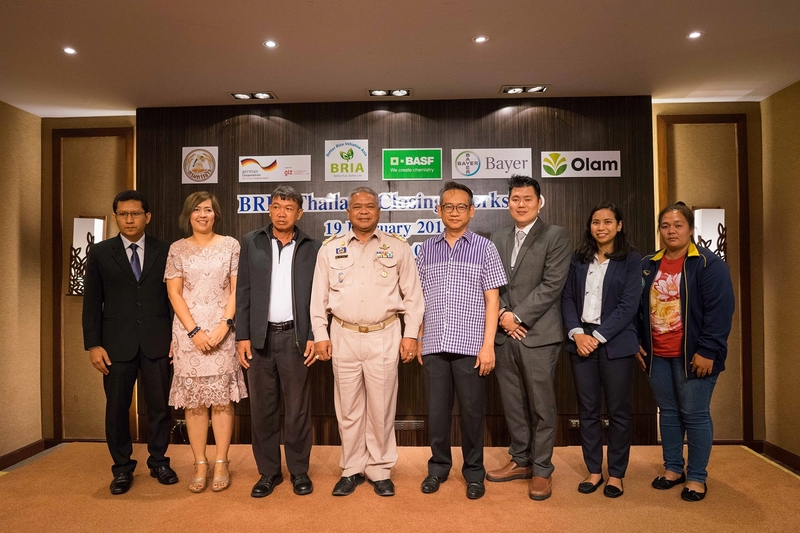 “The project has also created a marketing model that enables farmers who follow the Sustainable Rice Platform (SRP) and Good Agricultural Practices (GAP) standards to connect with 200 rice centres in Ubon Ratchathani, Surin, Sri Sa Ket and Roi-et provinces. Furthermore, television campaigns entitled the “Farmers Love” series screened from 2015 to 2017 promoted safe pesticide application, soil management, quality seeds and sustainable rice production. Materials on post-harvest management have been produced to help farmers minimise losses and improve quality. “BRIA has found a good way to pass on new rice production technology to the farmers,” he added. Voicing his optimism for the future, GIZ’s Regional Project Director Suriyan Vichitlekarn said: “Apart from our activities here, BRIA has established 375 Sustainable Rice Production Centres (SRPC) in the two Indonesian provinces of East Java and North Sumatra. These are staffed by 125 field coordinators who train farmers in sustainable rice production. “In the Philippines, the project has contributed to the country’s long-term targets of food security and global competitiveness. The local government units (LGUs) and their respective extension service-delivery mechanisms were strengthened by training agricultural extension workers (AEWs) and lead farmer technicians (LFT) in Iloilo, Southern Leyte and Aurora, with an outreach of around 8,000 farmers. “In Vietnam, the project has joined hands with the Institute of Policy and Strategy for Agriculture and Rural Development (IPSARD) and the private sector to pilot public-private partnership (PPP) models for large-field rice cultivation in the three provinces of Dong Thap, Hau Giang and Kien Giang. The aim here was to improve the quality of rice, optimise value chains and strengthen local cooperatives. This has helped boost the income of farmers who can now reach high-quality markets. “In the four participating countries, BRIA has supported the training of more than 20,000 farmers and their income has increased by 10-25 percent following the training. “In Thailand, on average each family earns around 29,111 baht per year. “These results reflect BRIA’s success in improving rice production that is friendly to the environment and improves the quality of life of the farmers,” said Suriyan. Today, the project is a regional success. Participants have learned new lessons and received valuable advice that will be helpful in setting national and regional policies on sustainable rice production, resulting in food security in ASEAN as a whole.